After leaving Caja Muerte we once again turned East, turned on the engine, and pushed into the wind about 6 hours to get to Salinas. As Solace passed through the mangrove lined entrance to the harbour, I turned to Barb and wondered outloud if we would know anyone here. It was a bit of a deja vue. The first boat I saw was Twilight, a 60' Steel Fishing boat turned Trawler painted Red & White. Also, I might add, the first boat we had seen upon entering Puerto Blanco (Luperon) 5 months before. All in all, there where 5 boats there from the Luperon crowd including Archateady, ConchDaddy, Merlin, and Twilight. In the guide books, Salinas is touted as a great place to provision, get boat parts, and generally get done projects that have been waiting since Luperon due to lack of parts or expertise. They must be talking about another Salinas. The one Chandlery is about the size of a 2 car garage and makes West Marine look cheap. All of the roads are completely torn up do to a sewage problem (it overflows onto the streets everytime it rains), and there is no public transportation which makes getting to and from the grocery store that is two and a half miles from the dock, either tiring or expensive. The only redeeming quality is that the harbor itself is calm with good holding and protected from every direction. Good place to duck into when bad weather approaches. We stayed there for two days..just long enough to participate in the festivities celebrating Loretta's birthday. 39 again? Loretta, Wayne and their two Poodles are aboard ConchDaddy, a 45' Island Trader with a big back deck perfect for a party of 10 (we had 15) and a big grill. We left Salinas early the next morning with flat seas and almost no wind. A great day to motor the 60 miles to the island of Vieques in the Spanish Virgin Islands, off the east coast of Puerto Rico. One of the most intriguing aspects to cruising is that you never know what you are going to find in the next port. No matter what you hear, read, or imagine, the majority of the time it's vastly different than what you expect. 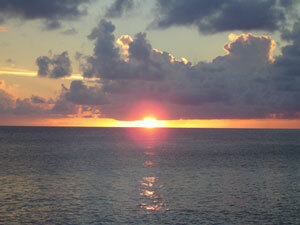 Vieques was true to this observation. Since First Light, Highlander, and some other friends where planning on spending Christmas in Culebra and Barb would be flying out from San Juan shortly before, I planned to spend only a couple of days in Vieques. On the crossover from Puerto Rico, heading for the southern coast, we noticed that the Western part of the Island was completely deserted except for a large strange field that looked like a golf driving range. I did not find this particularly strange, although the location seemed odd. I later found out that it is the transmitting half of a huge radar setup, the receiving half being on the Puerto Rican mainland. Aricibo? I never found out. Esperanza is a fairly well protected bay wedged between a little island named Caja Real and the south coast of Vieques. Exactly in the middle of the island. We arrived in late afternoon and found the water crystal clear and the holding good. Solace seemed to be the only transient in the bay. There is a healthy remnant of a large concrete pier, that obviously used to be commercial jutting out into the bay which made securing the dingy easy. Five open aired restaurants / guest houses greeted us on the little strip facing out on the bay. Banana's looked to be the most laid back (although I later found that laid back was the only speed on the island ). Bob Marley in the background, a couple of big cheeseburgers, and two well appointed Margaritas as we watched Solace roll gently and the sun slip into the bay. Someone should write a song about it. Morning well spent. Barb and I both found a conch (ie. dinner) and explored the Ship Wreck on Caja Real. Heavy 45' Steel Schooner that is on the rocks about 40ft from the waterline. A testament to the power of a good hurricane. Couple of stainless steel winch bases that I wouldnt mind salvaging. A couple of kayakers approach the boat in the afternoon. Thus I meet Isaac, an extremely outgoing and talkative gentleman from NYC who is on vacation for 5 weeks with his wife and newborn. Isaac owns two Discount Fashion outlets in NYC called FindOutlet. He is Puerto Rican by heritage, and although raised in NY, he has been visiting relatives in PR all his life. Isaac graciously volunteers to show Barb and I around the island and we agree to meet onshore the next morning. Ok.....now I remember where I have heard of this island before! This is the one that the Navy was bombing!! and people where handcuffing themselves to trees and throwing there boats in the paths of Battleships! Funny...it seems so quiet. As we learn through our day of sightseeing, the protestors finally won and the Navy pulled out only about six months before. Isaac, who has been visiting Vieques for 5 years, says that when they where bombing, you could barely here the explosions, but you could feel your ears pop and feel the air being sucked out of an apartment window from the implosions 10 miles away. 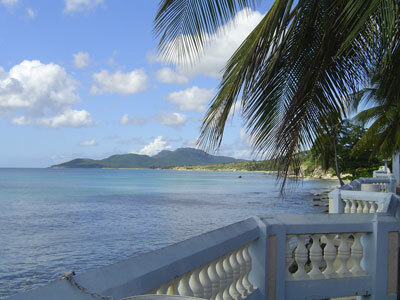 Vieques is 18 miles long from West to East and 4 miles at it's widest. The military base controlled the East Third and the West Third, leaving the middle for a small Spanish town and few struggling hotels. Isaac had met Al Sharpton at breakfast a few years before. Seems Al had flown in at around 8 in the morning, gotten arrested a little after lunch and then made the Red Eye back to Carolina that night. Busy schedule. There are still plenty of signs that the protests are still recent memory. Seems that the natives think (and it may be true) that the Navy was using experimental depleted uranium (and the like) shells. They claim that Vieques has a cancer rate that is 37% above normal and blame the Navy for all cancer related deaths on the island. Now that the military has pulled out, both end thirds of the island are national parks, with absolutely gorgeous beaches and hiking. I imagine that in the next few years, it will become a very busy tourist destination. Probably a good place to buy some land. Barb took a shuttle to San Juan to catch her plane back to Boston. After a year on the boat, she has decided to return to New England to become a ski instructor and continue to nurture her budding writing career. Also, she misses her dog Swat. Barb will be joining me for a month or so each year for further adventures and pen fodder. Isaacs wife bought him a 10 day charter on Solace as a Christmas present. Isaac states that he has always wanted to go to Foxy's, on the Isand of Jost Van Dyke, in the British Virgin Islands....for the famous New Years Eve Bash. We lift anchor on Christmas day.